Josh Biffle knows gelato. Having studied the art of gelato under lauded makers in Italy — where he met wife and partner Diletta Gallorini — Biffle lets his palate and love of fresh ingredients do the talking. 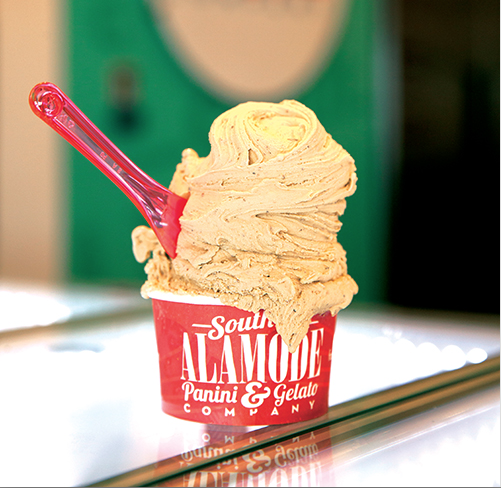 At South Alamode Panini & Gelato, you’ll want to try the pistachio as every batch of pistachio gelato is made with pistachios imported from Bronte, Sicily, toasted and made into a paste in-house. Or stop by for velvety takes on peanut butter, nutella, ricotta, goat cheese and other hard-to-find flavors such as Zuppa Inglese (citrusy custard, chocolate hazelnut sauce and spiced cake) or Struffoli (their take on a Christmas-time dessert found in Naples that combines deep fried dough balls, honey and spinkles). The San Antonio river isn’t exactly the Amalfi Coast, but this gelato gets us as close as we’re going to get for the time being.